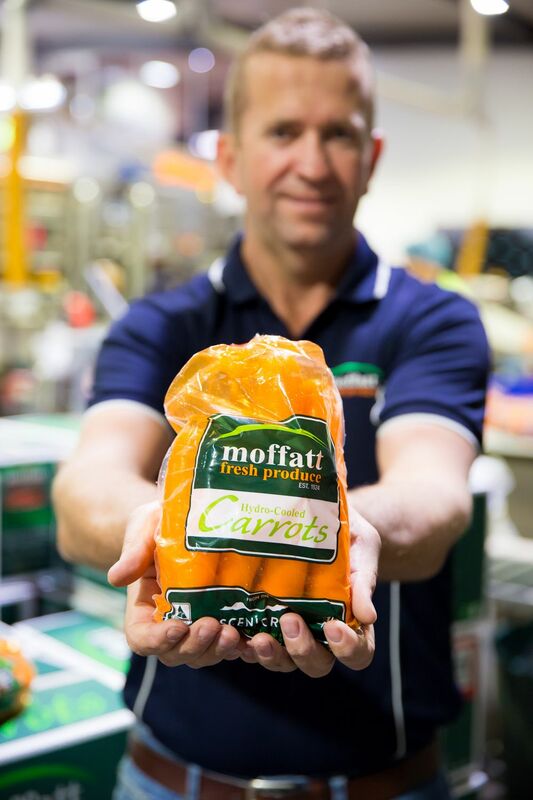 Armed with a rich family history of farming that spans almost 100 years, Steve Moffatt and his team at Moffatt Fresh Produce are well-equipped to achieve their goal to produce the best carrots and onions in Australia. As the AUSVEG team found out during a visit to the company’s headquarters in Tarome, Queensland, there is plenty of family history left to be written. In a picturesque pocket of south-east Queensland, a bright blue sky shines down on the Fassifern Valley, effortlessly creating postcard views of the mountain ranges that hug the surroundings of Moffatt Fresh Produce. The loamy creek soil flats typical of the Tarome area are as rich as Moffatt’s family history, which traces back to 1924 when Robert Moffatt and his son Allan (better known as Scotty) planted their first crop as share-farmers. Today, Moffatt Fresh Produce is fast approaching its 100-year anniversary, and the successive generation of farmers shows no signs of slowing down the family trade. “We’re a fourth generation family farming operation and we have a fifth generation coming through the business now. We started from pretty humble beginnings – this far down the track, you would consider us to be a large-scale horticultural operation,” Moffatt Fresh Produce Managing Director Steve Moffatt says. Scenic backdrop aside, Tarome was chosen as the home of Moffatt’s all those years ago thanks to its favourable climate, alluvial soils, reliable water supply and proximity to key markets, providing a solid foundation on which to build the business. 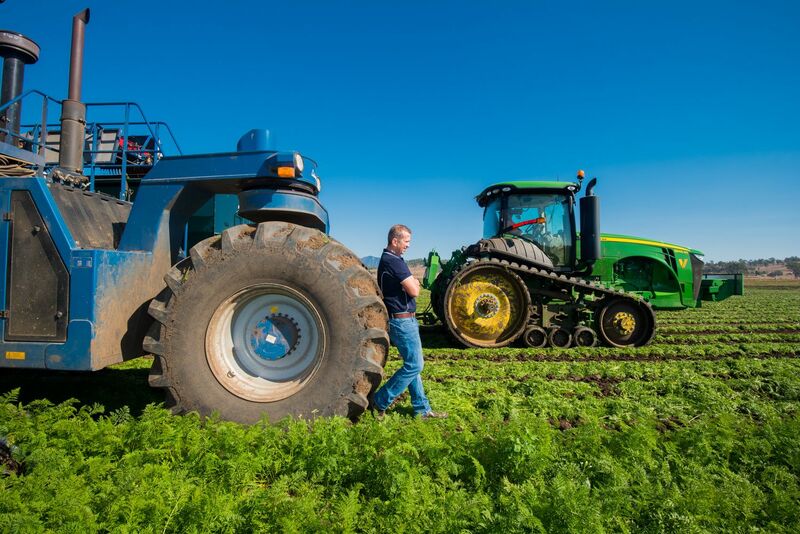 While Moffatt’s has dabbled in growing various vegetables over the years, its flagship commodity – carrots – have been a staple of the business since the 1960s when they were grown on just 10 acres. 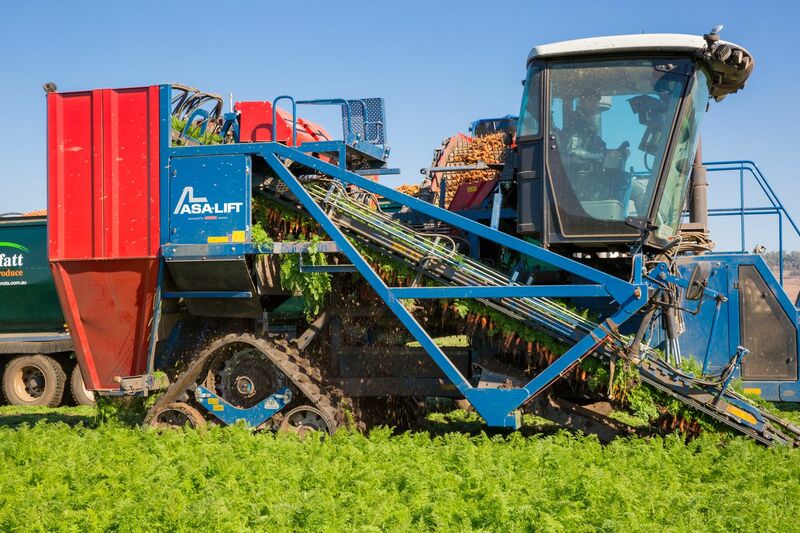 Today, Moffatt’s carrots are produced across three regions in Queensland, including the Fassifern Valley, Southern Downs and Granite Valley, allowing the business to produce a year-round supply to the tune of 25,000 tonnes a year. “Everything we have here today is the result of the generations before us. 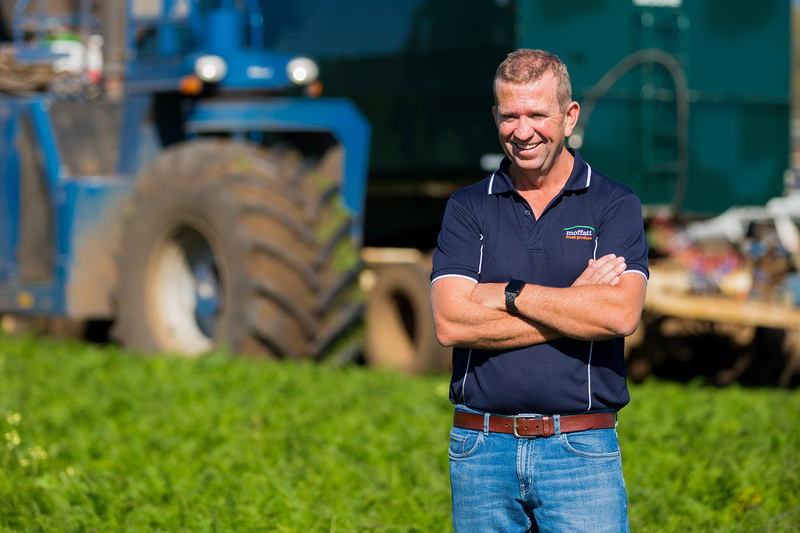 We’re quite proud of the fact that we’ve been able to manage succession within our business – the benefits are that each generation improves, and off the back of that the farm improves,” Steve says. Family is at the heart of everything at Moffatt’s. Relatives are scattered throughout the business, with Steve at the helm, his wife Jenny in administration and his cousins Mitch in the paddock, Nicholas in the factory and Krissie on reception. They are part of a team of 55 full-time employees and around 40 casual workers in the peak season. With so many years of farming behind them, it is understandable that the scale and structure of Moffatt Fresh Produce has changed significantly since its inception in the 1920s. As Steve points out, that is largely due to the family’s vision for the future and access to technology. “We had a focus of where we wanted to be. We needed to get better at what we do, not just in the farm but in the factory. We drive efficiencies on a daily basis here; we record those efficiencies and we judge ourselves on our own scorecard to continually become better,” he says. 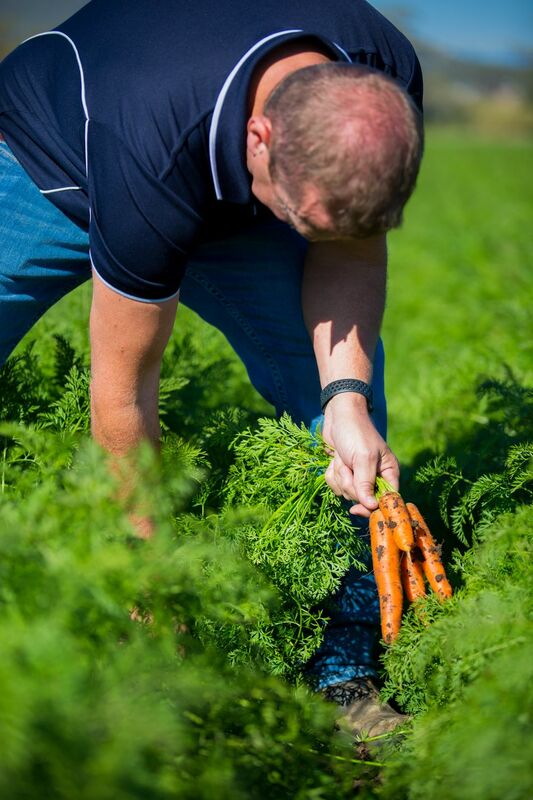 These efficiencies are weaved through every facet of the farm, to the point where carrots are delivered to customers within 24 hours of harvesting, and product can be traced from seed to plate. “We have internal processes in place to follow the produce from the farm to the factory, and that’s a program that we’ve built on-site over the last decade to suit our own needs and our customers’ needs,” Steve explains. It takes an outsider to recognise that Steve’s description of these efficiencies is modest, to say the least. The newly-developed washing and packing facility at Tarome runs like a well-oiled machine under – quite literally – the watchful eye of team Moffatt, who have a view of the production floor from the office. While electronic grading is a key feature of the production facility and its quality management system is HARPS and Freshcare accredited, there are other plans in the works. “There’s a lot of discussion around packaging at the moment, and I would have to say that’s probably our key focus right now – we’re still working on that,” Steve hints. "Our greatest achievement is that we can continue to be a wholly Australian-owned family business heading towards 100 years of operation. It’s a testament to the generations before us that we’re still going this strong." An increase in on-farm efficiency goes hand in hand with increased production, and to avoid an oversupply in the domestic market it is natural to look abroad for potential customers. Carrots are king in the vegetable export space and with a booming Asian middle-class on our doorstep, there is plenty of opportunities available for growers like Moffatt. Through the Vegetable Industry Export Development Program (VG16061), a strategic levy investment under the Hort Innovation Vegetable Fund and facilitated by AUSVEG, Moffatt Fresh Produce has relished the opportunity to build its knowledge on exporting produce to international markets. Their team has attended export readiness training, seminars, showcased their produce at international trade shows including Asia Fruit Logistica in Hong Kong and Foodex in Tokyo, and met buyers from key markets overseas. Moffatt’s was also a pit stop on the recent 2018 Reverse Trade Mission, which allowed 40 international buyers from Asia and the Middle East to tour regional Queensland. The mission culminated with the Taste Australia Fresh Produce Showcase, where a collection of export-ready growers, including Steve, displayed their produce and networked with the international delegation. “We liked that we could show all of the delegates first-hand what we do on the farm so they could understand the scale of our business. A picture is as good as a thousand words, especially when it comes to things like scale – you don’t appreciate it unless you see it yourself,” Steve says. A visible shift in the latest chapter of Moffatt Fresh Produce is how they have shared their family history and vision for the future, particularly through branding, online and social media. “We’re humble people from humble beginnings. We don’t like to tell everyone how great we are, but our Business Development Manager Brei Montgomery managed to convince us that it’s about helping people to understand and appreciate our story, and allowing Australian consumers to be part of it,” Steve explained. The farm is active in the local community, donating excess produce to Foodbank Queensland and participating in events such as the Scenic Rim’s Eat Local Week and Winter Harvest Festival, where its popular carrot ice-cream was a hit with consumers. “We’re about the future, and building long-term sustainable relationships. We’ve got a good customer base and obviously we’ve got a great team working behind us here,” Steve says. This grower profile first appeared in the leading magazine for the Australian vegetable industry, Vegetables Australia, and was featured in the AUSVEG Weekly Update published 12 February 2019. If you’d like to subscribe to receive a new edition of Vegetables Australia in your mailbox every two months, use our online subscription form!